Choose an old fashioned apple dessert recipe and make a tasty dessert dish that everyone will rave about. There's something about the flavor of apple that satisfies and reminds one of home and comfort. Whether it's an apple crisp, a vintage pandowdy, or apple dumplings, you'll love eating them. 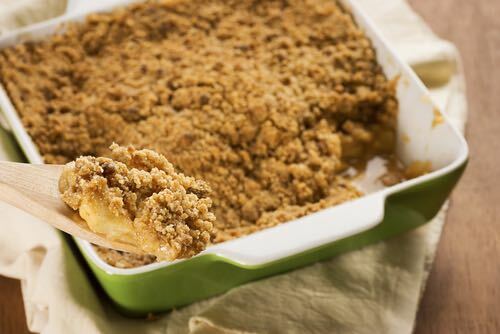 This recipe for apple crisp can be used with any type of apple, but I like it best with either tart Granny Smiths or Jonathons. Slice the apples into a buttered loaf pan; peeling is optional. Add cinnamon and water. Combine the flour and sugar, then cut the butter in until the texture is similar to that of dry rolled oats. Spread the mixture over the apples, and bake uncovered at 325°F for 40-45 minutes. Let the crisp cool before serving. Top with heavy cream or vanilla ice cream. Thank you for this recipe! My family is a big fan of crisps and cobblers, so I'll definitely try this one. —Anon. 1 cup brown sugar, 1/4 cup all-purpose flour, 1/4 teaspoonful cinnamon, 1/4 teaspoonful salt, 1 cup water, 2 tablespoonfuls butter, 1 teaspoonful vanilla, 1 teaspoonful lemon juice. Blend brown sugar, flour, cinnamon, and salt in a saucepan, then stir in water and cook on medium heat until sauce mixture thickens slightly, then stir in butter, vanilla, and lemon juice. Set aside. 1 cup flour, 1 tablespoonful white sugar, 2 teaspoonfuls baking powder, 1/4 teaspoonful salt, 3 tablespoonfuls shortening, 1 beaten egg, 1/3 cup milk. Prepare the drop batter by blending flour, sugar, baking powder, and salt, then cut in the shortening until all is finely mixed, add egg and milk, and stir with a fork to make a drop batter, but do not over mix. Set aside. Note: To "cut in the shortening," simply take a fork and mash the slightly chilled shortening into the dry ingredients until it forms little crumbs of dough. It's the little lumps of shortening remaining within the flour mixture that gives a flaky texture to the baked biscuit topping. Peel and slice enough tart apples to make 4 cups, arrange apple slices in a buttered 9-inch square baking pan, and pour sauce over the apples. Drop spoonfuls of batter over the apple/sauce mixture. Do not stir. Bake in oven at 375°F for about 35 minutes or so. Serve caramel apple pandowdy warm plain, or garnish it with freshly whipped cream. Slice apples into a buttered pie plate or shallow baking dish. Mix together as you would for pie crust, 1 cup flour and 1/3 cup butter, and work in 1/4 cup brown sugar. Sprinkle the apples with granulated sugar and nutmeg to taste. Spread the flour mixture over the top and bake at 375°F until the apples are cooked and the top well browned. Serve warm with cream. For this apple dessert recipe, first make a biscuit dough by sifting flour, baking powder, and salt together several times, then rub in the butter and cut in the milk. Toss dough on a floured board. Roll in thin sheet, cut in six rounds. Core and pare 6 apples. Place each apple centered on a round of dough. Mix together 6 tablespoons of sugar and 1/2 teaspoon cinnamon and pour 1 tablespoon of this mixture into the cavity in each apple. 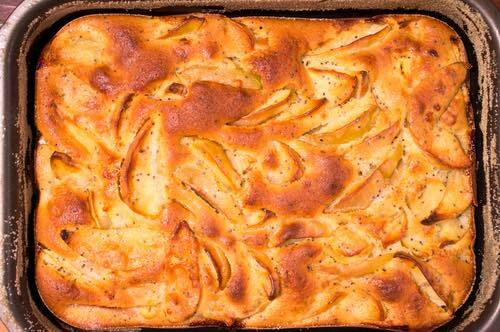 Draw up the dough to cover the apple, moisten edges and press together and steam bake till apples are tender. Serve warm with sugar and cream or with a custard sauce. If the apples are sliced instead of being left whole, they will cook more quickly.